It’s Good Friday/Easter and that means, CHOCOLATE AND HOT CROSS BUNS! Today I’m sharing a very chocolatey cookie recipe with you. If you’re still hunting down a hot cross bun recipe to bake today or over the weekend, let me help you out, here’s my Gluten & Dairy Free Hot Cross Bun recipe, you’re welcome! 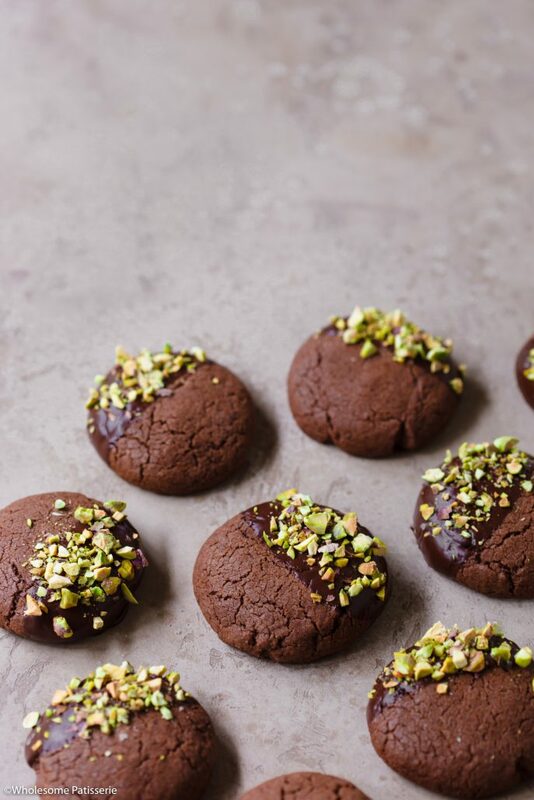 I’ve had this idea to make my favourite cookie recipe but to add a little something extra and pistachios have been on my mind! 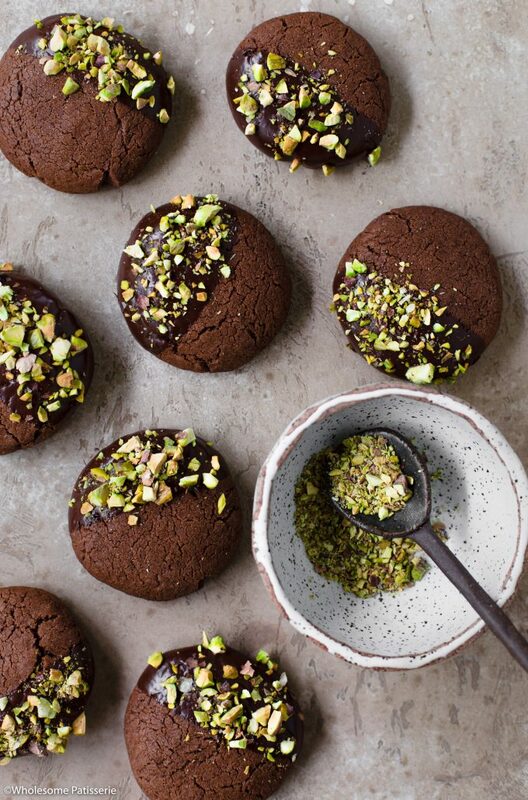 So here you have the best cookie recipe (well in my humble opinion) topped with melted dark chocolate sprinkled with pistachios! Yum yum YUM!! These little beauties are absolutely perfect for this Easter weekend break and you’ll have to get the entire family involved with this one! I chose to make these cookies gluten free by using gluten free all purpose flour, I use Bob’s Red Mill ‘1-1 baking Flour’ but if you don’t have any gluten sensitivities, you’re more than welcome to go ahead and use your go-to regular wheat all purpose flour. 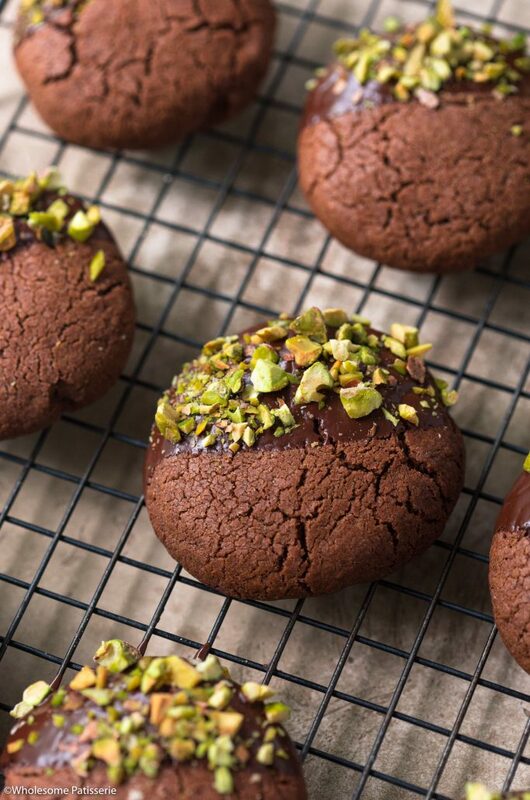 With the cocoa in this recipe, I LOVE to use Organic Times Dutch Process Cocoa Powder (it’s my go-to cocoa for baking) and it’s provides these cookies with that classic rich chocolate flavour and colour. If you’re using Dutch Process Cocoa, 2 tablespoons is plenty! If you’re using regular cocoa or cacao powder, still use 2 tablespoons but your cookies may just be a little lighter in colour compared to mine in these photos. Nothing wrong with that, they’ll still taste amazing! Preheat oven to 180ºC (356ºF). Line a baking tray with parchment paper, set aside. Combine flour, cocoa, baking powder and baking soda together in a mixing bowl. Mix well and set aside. Using a hand mixer or a stand mixer fitted with the whisk attachment, whisk together coconut oil and coconut sugar in a large mixing bowl until well combined and just beginning to get fluffy. Add egg and vanilla, whisk until light and smooth, approx. 15-20 seconds. Gradually beat in flour mixture until it begins to form a soft dough. Using your hands, form into a smooth dough. Wrap dough in cling film and refrigerate for 15 minutes. Remove from refrigerator and pick up approx. 2 tablespoons worth and roll into a ball. Place on prepared lined tray and press down slightly, leaving a 1-inch gap between each cookie as they do spread. Repeat with remaining dough. Bake for 10-12 minutes or until lightly golden and cracks have formed on top. Remove and cool on tray for 2 minutes. Place another baking tray or a sheet of baking paper underneath the wire rack the cookies are sitting on. Have the melted chocolate in a shallow bowl. Once cookies have completely cooled, dip half of each cookie in the melted chocolate, letting excess chocolate drip back into the bowl, place back on wire rack. Repeat with remaining cookies. 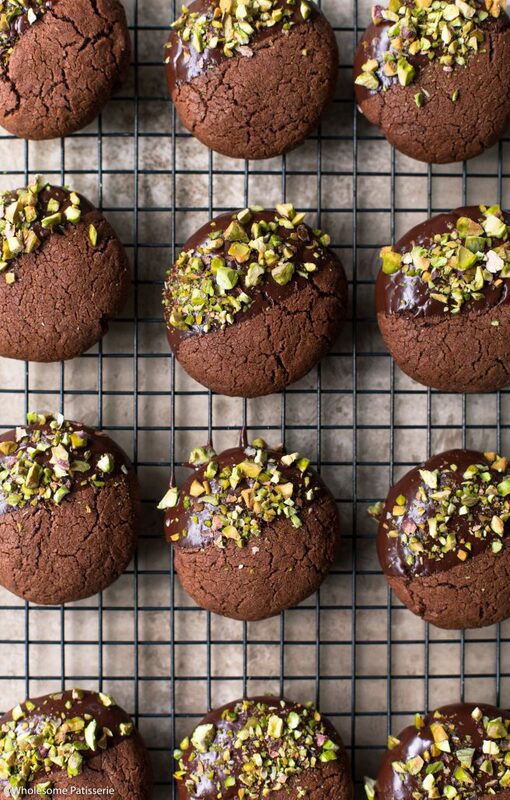 Before the chocolate sets, sprinkle over the chopped pistachios onto the melted chocolate half. Allow to set at room temperature. Store in an airtight container, in the pantry or refrigerator, for 3-4 days.